"We Will Achieve Sustained Growth by Creating Values to Share with Society"
Mitsubishi Gas Chemical America (MGCA) has been leading the way in a wide range of fields, from basic chemicals to fine chemicals and functional materials in the United States since 1984. As a subsidiary of Mitsubishi Gas Chemical Company, INC. (MGC) in Japan, MGCA has in common the MGC philosophy "to contribute to societal growth and harmony by creating a wide range of values through chemistry." MGCA serves all of North and South America with a variety of products, such as natural gas chemicals, IT and technological raw materials and food, pharmaceutical and healthcare support applications. While MGC focuses on specializing, differentiating and creating high performance products that respond to the demands of every market-place, MGCA is able to focus on you, the customer. Through customer service, logistical knowledge, technical assistance and superior products, MGCA is here to help and guide you and your company into the future. Aligning with the new MGC group vision, "Creating values to share with society," MGCA will contribute to customers in this region. Mitsubishi Gas Chemical Singapore Pte. Ltd.
Mitsubishi Gas Chemical Shanghai Ltd. Compliance for Mitsubishi Gas Chemical America, INC. It is therefore necessary to prevent misconduct in the company and in oneself through understanding and practicing “compliance” correctly. 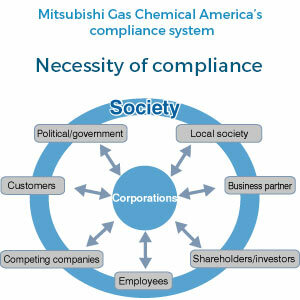 Furthermore, by practicing compliance and conducting business activities in a fair, open manner, the company will earn the trust and sympathy not only of Mitsubishi Gas Chemical America’s stakeholders, such as the shareholder, customers, local communities, and employees, but also of society in general. This will lead to smooth business activities supported by local communities, the acquisition of new customers and markets, growth of corporate value due to better evaluations by shareholders/investors, and will contribute to further growth of Mitsubishi Gas Chemical America and MGC. Mitsubishi Gas Chemical America (MGC-A) Officers and employees, including temporary and no-regular staff, have an obligation to observe compliance, and should they become aware of any violations of compliance, to rectify these via the corporate organization. The "Compliance Committee" presides over compliance for the corporate group, under the direct control of the president. Compliance committee are composed of the Chief Compliance Officer appointed by President, and the head of compliance-related departments, and have the below duties. Establish and discuss group compliance system, policies and measures etc. Conduct investigations, corrective measures, reoccurrence prevention and discussions with regards to compliance violations. The policies, guidance/supervision related to compliance discussed and established by the Compliance Committee, and corrective measures and reoccurrence prevention related to violations will be reported to the president and board of auditors, and implemented as per standard company procedure. Further, MGC-A officers and employees must cooperate with Compliance Committee investigations. Furthermore, if compliance violations (or feared violations) are not, or it is feared will not be, rectified via the corporate system, the facts of the violation or information sufficient to make the accusation of compliance violation believable must be reported to the &ldquo;Compliance Consultation Desk.&rdquo; In addition to officers and employees, their the families, affiliated companies, partner companies, customers, and anyone involved in business activities with MGC-A can consult with or provide information to the Compliance Consultation Desk either in New York (MGC-A) or Tokyo (MGC). As a rule, the Compliance Consultation Desk will require that you reveal your name for consultations and reports so that you can be contacted with the results of investigations or deliberations and to deter malicious libel and slander. Further, you are requested to make your consultations and reports by letter, FAX, e-mail or other media that leave a record. However, the Compliance Committee will accept anonymous phone calls or Faxes only when circumstances render it necessary to do so. However, please be aware that investigations or consultations with an anonymous complainant may sometimes prove to be insufficient. MGC-A officers and employees who make consultations and reports shall not be subjected to such disadvantageous actions as transfer or discrimination due to the consultation or report or due to cooperation with an investigation. In the case of MGC group companies or customers, instructions will be given to the relevant department/group company so as to confer no disbenefit. However, if the consultation or report is made with the objective of framing another person, or with the objective of pressuring, blackmailing or other illegal motives, this restriction shall not apply. Please inform the Compliance Consultation Desk of an advantageous or disadvantageous relationship with members of the Compliance Committee or the Compliance Office at the time a consultation or report is made to insure that the matter will not be disclosed to that person.